Exactly a year ago today Paul and I were in Europe. It was the first time for us both and we fell in love. Like a deep set, we both probably should have been born in Europe love. Ironically this post that I am sharing today is inspired by an avocado toast that I had in a restaurant in Budapest. It was so good we went back three times just to get this same avocado toast. The restaurant is called Liberte Grand Cafe & Restaurant and if you are in the Budapest neighbourhood I highly recommend it. Not only was the avocado toast delicious, their french toast was unlike anything I have ever had. About two inches thick, pillowy soft and covered in a luscious raspberry sauce and whipped cream. The americanos were a total delight as were the fresh squeezed juices and grand salads. Needless to say we went back more than once, in fact on our last morning in Budapest while Paul stayed back to rest a little I went back for one last avocado toast by myself it was that good. So yes, this post is completely inspired by the Liberte and our time in Europe. How they actually made their avocado cream I am not sure but the one on this here toast of mine is pretty grand itself. 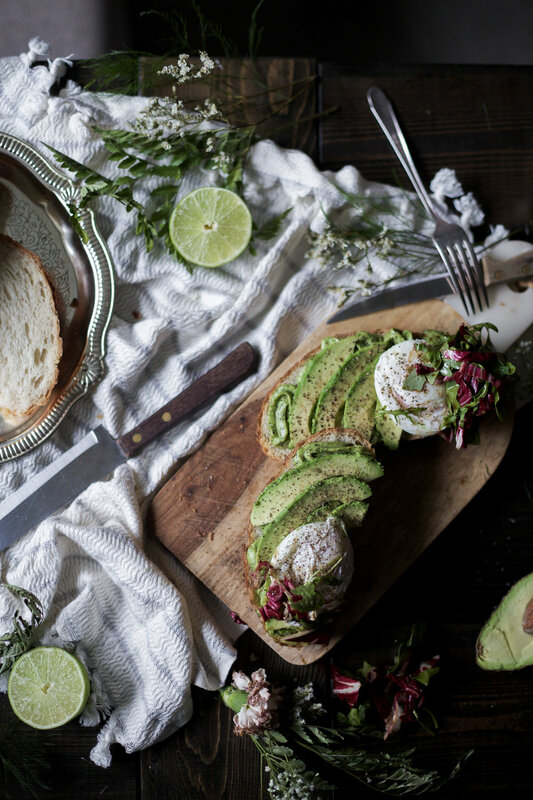 It is the simplest of recipes really but going that extra mile with the avocado cream and then the thinly sliced avocado on top makes this easy breakfast seem a whole lot more magical. Plus we all love avocado so why not jazz it up a bit two ways! Feel free to get fancy and pipe on the avocado cream like I did for these photos but reality is I mostly just spread it on, no one needs to hassle of cleaning piping bags in the morning. I hope this post can inspire you to remember one of your favourite travelling meals, share it with me below if you feel called. Food memories and stories are pretty much my favourite thing to hear. in a food processor add one avocado, along with the rest of the avocado cream ingredients and blend until smooth. set aside in the fridge. toss your arugula and roughly chopped radicchio with a tbsp of balsamic glaze. set aside. heat the water: add enough water to come 1 inch up the side of a narrow, deep 2-quart sauce pan. bring to a simmer over medium heat. add the whole eggs with shell gently into the water for 10 seconds, take the eggs out and let cool down for 30 seconds. this trick will help keep the egg white together when you crack the egg into the water (it is Julia Child's trick and it works amazing). add 2 teaspoons of white vinegar to the water and bring it back to a simmer over medium heat. gently crack the eggs into the simmering water one at a time. let them poach: once you crack the eggs into the water, let them sit, don't poke at them. you can gently lift them from the bottom after a minute or so if they are sinking. I let my eggs simmer for about 5 minutes and I find that is the perfect medium poach. adjust time accordingly to how you like your eggs poached. remove the eggs with a slotted spoon and set onto a piece of paper towel. toast your sourdough. spread or pipe your avocado cream onto the toasted sourdough. add some thinly sliced avocado on top of the cream. next add your poached egg and top with some arugula & radicchio tossed in balsamic. season with salt and pepper and serve.